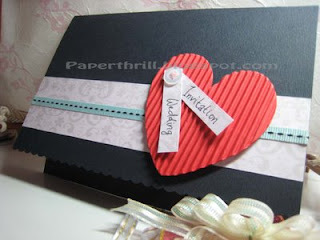 I created this wedding card with versatility in mind. I wanted couples to be creative and imaginative as I feel wedding cards should reflect their personality. One area of focus is on the red corrugated heart. Couples can have their names inscribe onto the pink floral-motif tags or if they prefer, they can just leave it as 'Wedding Invitation'. These tags are then joined at one end and buttoned to the heart. 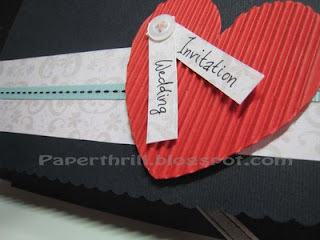 Invitation wordings can be printed on the inside of the wedding card, on a separate floral-motif or colour cardstock. lovely card...can u email me the price for this type of card? tq. Hi, pls leave your email and we'll email you the details. Thx!